While Valletta in Malta is a spectacular tourist destination and popular cruise port in the Mediterranean, do not hesitate to venture further inland in your exploration of this tiny island. 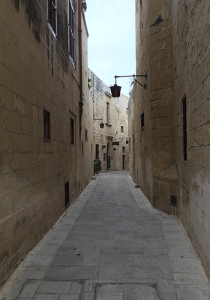 One town you should not miss is the walled city of Mdina. Mdina comes from the Arabic word medina meaning walled city – and that is an accurate description. It is probably one of the best examples of a true walled city this writer has seen (and favourite so far) in her Mediterranean adventures, the others being the old walled section of Rhodes, and the Vatican. Approach to the city is up a hill as would be expected of a great fortress whose defenders must be able to see the approach of any enemies. Outside the main city gate in a small park area, stand horse drawn carriages to transport you through its streets. No vehicles, other than those of the residents and emergency vehicles, are allowed inside the walls – and you will soon see why. If you don’t wish to hire a horse cab, then strolling on your own is a perfectly viable option. Past the city gate (no admission fee), you are confronted by narrow cobble-stoned streets and even narrower laneways and passages. Walls and buildings are almost all the same coloring, a light beige to grey, and in some places could be considered claustrophobic. This is not a modern city, and not vehicle friendly. 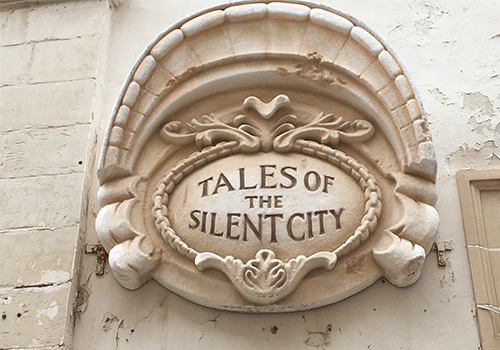 It is often referred to as the Silent City. One hears the birds, the church bells, the tour guides and their patter, the clip clop of horses’ hooves on stone, and the warning tinkle of bells to alert you to stand aside as a horse carriage is about to round the corner. No typical city sounds here. It is beautiful, stunningly so, as if you have stepped back in time. Time began for Mdina about 3800 years ago, and it reflects its various occupants’, or conquerors’, influences over this time to the present: the Phoenicians, the Romans, the Byzantines, the Arabians, the Norman Christians, the French, the British, and so on. It is purported to have been the area in which the Apostle Paul lived after being shipwrecked here, his home located in a grotto outside the gates in the surrounding city of Rabat. Mdina was once the capital of the island relinquishing the title in 1530. But ancient noble Maltese families still reside here as some of the few hundred permanent residents. One can not imagine a real estate sign here. Homes are inherited. As you stroll the city streets, take in the medieval and baroque architecture, the unexpected statues and plaques, the glimpse of greenery in inner courtyards, the rich chapel interiors, and the purposely modest shop fronts selling touristy items such as Maltese doorknockers and crosses, lace, and glassware. Visit St. Paul’s Cathedral with its glorious artwork on walls, in naves, even underfoot with marbled remembrances to important persons buried there. Perhaps you will be fortunate and arrive for mass. The atmosphere in this church holds one at once enthralled and humbled, a spiritual experience that is missing from modern churches. Look across the square from the cathedral to the palazzo Santa Sofia, the lower part of which was built in the 1200’s. Some buildings, such as it, were damaged heavily during an earthquake in 1693. Reconstruction fell to the French; hence you will observe part s of buildings and complete structures are in the Baroque style. Find a look out point along the city walls and take in the island spread out below you. Heed the warning signs – if you are tempted to climb on top of the wall to get a better picture and lose your footing, it is straight down hundreds of feet to the fields below! 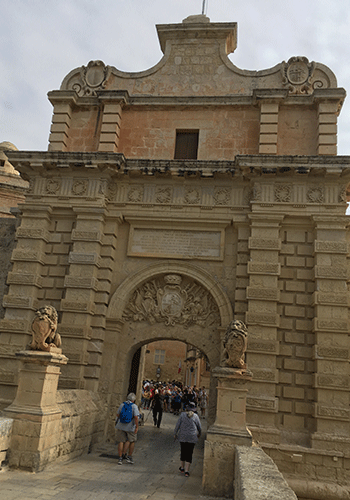 If you travel to Mdina on a Hop On Hop Off bus, be prepared to wait up to an hour for the return ride even in the shoulder season as this is a very popular tourist option. To see Mdina you have to opt for the North Route which takes you through the countryside and along the coast. We travelled in April, and only waited a half hour to continue our journey but some folks were complaining of being there twice that long as many buses were full. Be prepared to spend at least a couple of hours minimum to take in all aspects of the city and absorb its peaceful atmosphere. Do not fall into the trap of treating this place as a mere check mark on a long list of things to see and do in Malta. Be sure to wear sensible footwear as the streets are cobbled. There is no climbing stairs to speak of which is a great relief, as compared to other historical spots in the Mediterranean. If you have a serious appetite for history, take a guided tour from a local as there is so much to see and absorb, it is quite easy to miss an interesting feature – or see it, and not realize its significance. The carriage rides are fun, but you may not get as much history as if you were on foot with a guide. Or do both tours if you have the time and money. Dine in a café or restaurant to experience the full flavour of the region, both food and atmosphere. Many tourist shops carry the same items so compare to get the best prices if you are looking for an item to remember your visit. Article originally appeared in Real Travel Experts. All images courtesy of Compass Media.